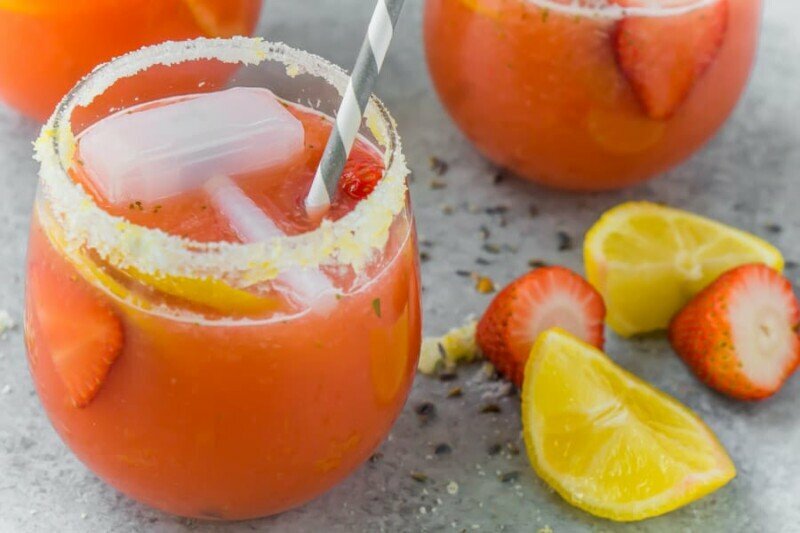 Next time you need a drink for a party, try this strawberry lavender lemonade recipe. It’s simple to make, flavorful, and absolutely delicious! It’ll be the hit of your next event. When you think of Thor, what’s the first thing you think of? A hammer? That killer smile? Strongest Avenger? God of Thunder? Or was it God of Sparkles? Yep, pretty much any of those things. You probably don’t think of a lavender lemonade when you think of Thor. But guess what? 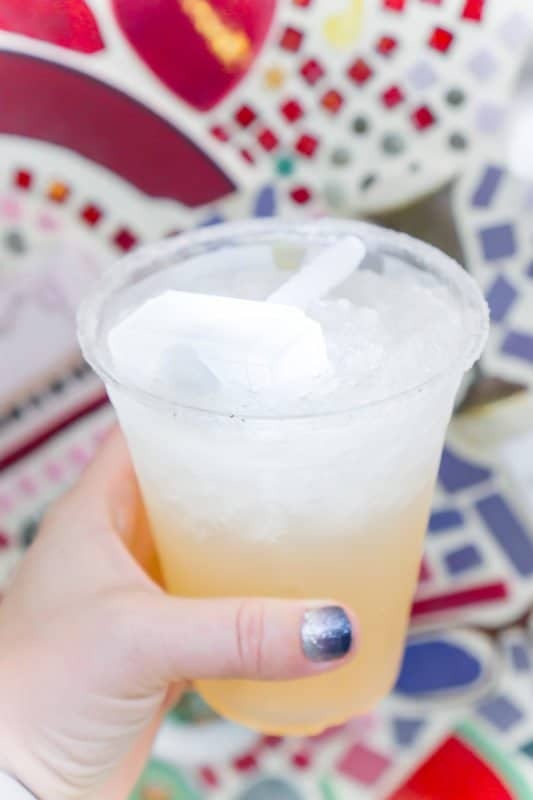 Disneyland apparently thinks that Thor goes well with lavender lemonade, so today’s post is inspired by Disney’s choice of drink associated with my favorite Avenger Thor. Let’s start by taking about Thor himself. If you know anything about the MCU and Avengers, you probably already know all about Thor – son of Odin and ruler of Asgard. You probably also already know that Thor and his hammer Mjolnir go hand and hand, or at least they used to until Thor: Ragnarok happened. You probably also knows he has an adopted brother named Loki who’s a bit mischievous. Okay maybe more than a bit. It’s hard to talk about Thor without talking about all of the changes to Thor and his world in Thor: Ragnarok. But I won’t because well spoilers. It’s still a newish movie and if you haven’t seen it yet, read my Thor: Ragnarok movie review then go see it right now. Then you’ll know what kind of changes I’m talking about – they’re big. Thanks Taika Waititi for that one! We’ve seen Thor in six movies in the Marvel Cinematic Universe – Thor, Thor: The Dark World, Thor: Ragnarok, Avengers, Avengers: Age of Ultron, and briefly in Doctor Strange. And we’ll see him in at least two more – Avengers: Infinity War and the Untitled Avengers Movie – with fingers crossed that he continues his contract and makes more movies. More movies like Thor: Ragnarok and less like Thor: Dark World. When I started talking to some of my other Marvel fan girlfriends about doing some sort of series leading up to the release of Avengers: Infinity War in April, we decided to do posts every other week that introduce a bit about our favorite superheroes and villains. We’ve broken them into groups based on the MCU movies and this week is all about the first Avengers movie. Next time we’re talking all things Captain America: Winter Soldier so make sure to check back in March for my take on a still to be determined character from that movie! This week Taty from Cool Moms Cool Tips from is talking all things Iron-Man with an Iron-Man cocktail I may have to virginize and make after I finish off this batch of lemonade. Tania from Lola Lambchops is taking on Captain America because Tania is pretty much #TeamCap herself. I’ve never seen someone so partial to one particular superhero. Then there’s Patty from My No Guilt Life who went with the god of mischief, Loki. Not only does she tell you why it’s okay to like Loki (hello Tom Hiddleston) but she’s giving you some hot looks to Disneybound like the villain. And I can attest for the fact that the looks are worthy of Thor’s little brother, I was with her when she wore her Loki Disneybounding outfit during our press conference with the Thor: Ragnarok cast! And me? Out of the rest of the Avengers, I picked Thor. I’ll admit I’m a bit biased because I got the chance to go to the Thor: Ragnarok red carpet movie premiere last fall and stand next to real-life Thor, Chris Hemsworth. And be in the same room as both his real life brother (Liam Hemsworth) and on-screen brother (Tom Hiddleston). But my love for Thor started way before I walked the red carpet. 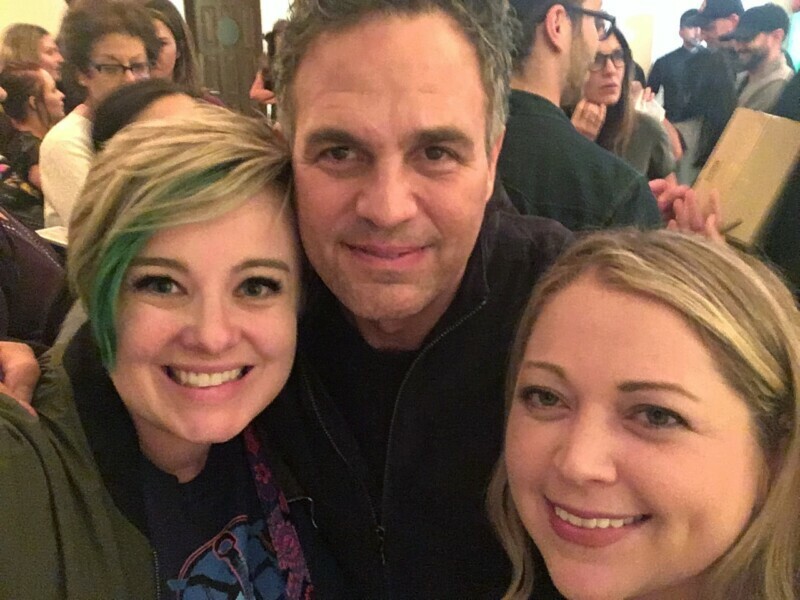 Before I chickened out and didn’t ask Chris Hemsworth for a photo and ended up with just a shared selfie with Mark Ruffalo instead (aka Hulk). I even made a #TeamThor shirt before I even knew Thor: Ragnarok was a thing. And I promise it has nothing to do with shirtless Thor. Although the Thor shirtless gifs never get old. Thor is my favorite because I love Thor’s sense of humor. It sounds so corny especially when compared to shirtless Thor but Thor’s sarcasm is my favorite. While Loki is all about dry one-liners and Tony Stark uses sarcasm but in a more arrogant way, I find Thor’s sarcasm and facial expressions to be hilarious. It’s like we’re speaking the same language, the same type of humor I try to use and I’m sure often fail. I’m so glad they finally let him bring out the humor more in Thor: Ragnarok because there were little pieces of it in the first five movies but Thor: Ragnarok really let them show Thor’s funny side. Okay, really it was Chris Hemsworth’s funny side. Either way, it’s a funny side that I adore. If Chris Hemsworth is hanging up his hammer after the Untitled Avengers movie, I just hope they get rid of Thor altogether because I honestly can’t imagine anyone else playing the character. I find Chris and Chris as Thor absolutely hilarious. Let’s just watch and laugh together now okay? Since that didn’t include much of Thor: Ragnarok, here is one of the funniest scenes from Thor’s latest as well. If you haven’t seen the movie, DO NOT WATCH THIS VIDEO! And one more – this time you get to see Chris Hemsworth’s sense of humor, which like I said, just seems to translate directly into Thor’s. There you have it friends. He may not be the strongest Avenger according to Tony Stark, but he is my favorite Avenger. And for the record, he would’ve made a great addition to #TeamCap in Captain America: Civil War. That’s the side I think he would’ve picked at least! I went to Disneyland on a mission to find the best things to eat at Disneyland and the best speciality drinks in the two parks as well. During that adventure, I happened to order a Lavender Lemonade from Schmoozies in Hollywood Land of Disney’s California Adventure. The lemonade was delicious but the coolest thing was that it came with none other than a glowing Thor hammer. Here’s an actual shot of said lemonade! Lavender lemonade definitely sounds like a Thor thing right? Strong almighty God of Thunder drinking a sweet and floral drink typically reserved for baby showers and other female get togethers. No idea how they associated the two, but I wasn’t complaining. I got a delicious drink and a glowing Mjolnir. Instead of trying to recreate Schmoozie’s lavender lemonade, I went with something a little more Thorish – a strawberry lavender lemonade. It’s still sweet and has a hint of lavender but the stronger flavor is strawberry, which is red and red is totally Thor. We’re going with that. I still can’t imagine Thor drinking a strawberry lemonade. I mean he doesn’t drink tea and lemonade seems to be along those same lines. But I kept that glowing Thor Hammer, added it to my lemonade, and voila – if Disney can do it, so can I. Even if it’s not really Thor relevant at all, it’s delicious. I actually prefer the strawberry version to Schmoozie’s version, sorry Disney! While the recipe seems a bit complicated, it’s really not. It’s really as simple as 1, 2, 3. Okay, 1, 2,3,4, still easy. 3 – Squeeze lemons for fresh lemon juice. 4 – Mix it all together! If you want to get a little fancy like I did, dip your glass rims in lemon juice then into sugar + lemon zest mixed together for a pop of color and added tartness. It’s a great little addition to the drink. Or skip the lemon and go straight sugar if you prefer more sweetness with your drink. Speaking of sweetness, if the lemonade is too sweet – add 1/2 cup of water at a time until it gets to the sweetness level you prefer. I like my drinks, and my superheroes, on the sweeter side. 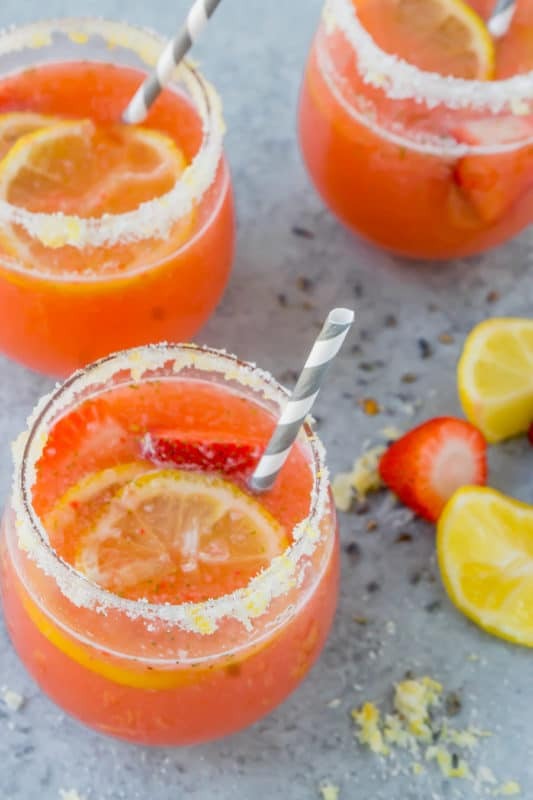 A sweet and flavorful lavender lemonade combined with a sweet strawberry puree! The perfect addition to any baby shower, bridal shower, or any other event! 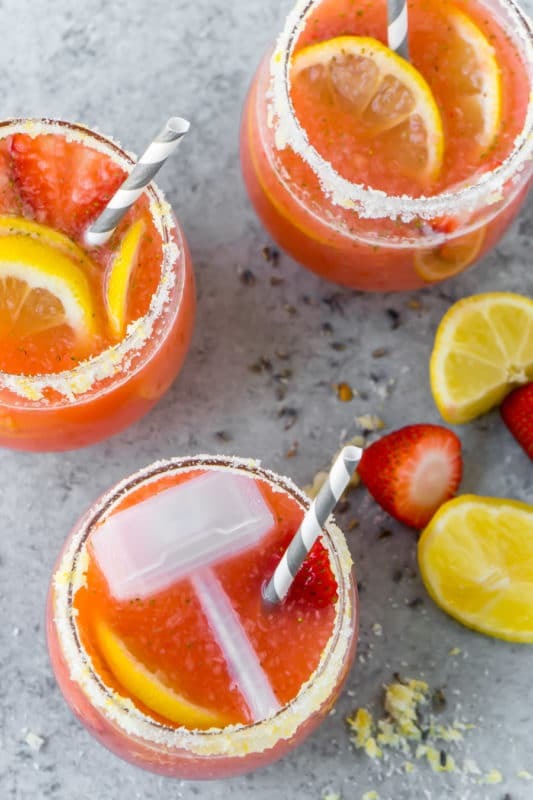 Combine simple syrup, strawberry puree, lemon juice, and water together in a large pitcher. Stir until combined. 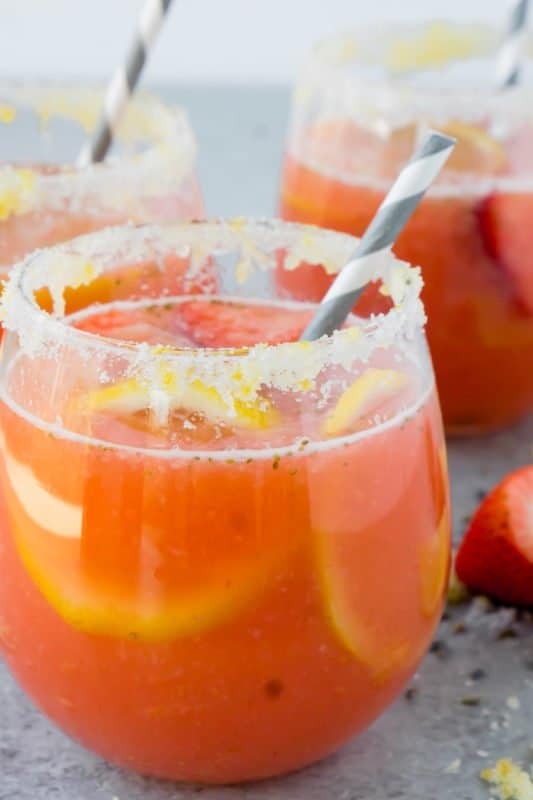 Garnish with fresh lemons, strawberries, and a lemon rimmed glass. Serve chilled. Combine sugar and water in a pot on the stove. Bring to a boil and bring until sugar is dissolved. Remove from heat and add dried lavender to the simple syrup. Allow to sit for 30 minutes to allow lavender flavor to get into syrup. Strain simple syrup with a fine mesh strainer to remove the dried lavender. Set aside. Place strawberries and sugar in blend and blend until pureed. Combine lemon zest and sugar in a different shallow bowl. Dip the rim of a glass first into the lemon juice and then immediately into the lemon sugar. Allow to set and harden before pouring lemonade into glasses. If you'd like the lemonade to be more tart - add more lemon juice. If you'd like it to be less sweet, add more water. 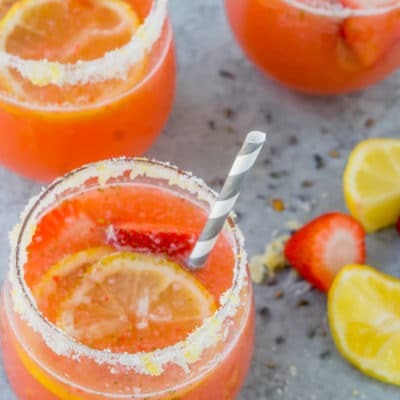 Don’t forget to pin this strawberry lavender lemonade recipe for later! Thor and this delicious lavender lemonade? Oh yes, you totally speak my language!